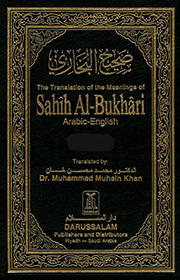 Sahih Bukhari is a collection of sayings and deeds of Prophet Muhammad (pbuh), also known as the Sunnah. The reports of the Prophet’s (pbuh) sayings and deeds are called ahadeeth. Imam Bukhari lived a couple of centuries after the Prophet’s (pbuh) death and worked extremely hard to collect his ahadeeth. Each report in his collection was checked for compatibility with the Qur’an, and the veracity of the chain of reporters had to be painstakingly established. Bukhari’s collection is recognized by the overwhelming majority of the Muslim world to be one of the most authentic collections of the Sunnah of the Prophet(pbuh).